"Great hearty vegetarian or vegan meal." Heat olive oil in a stockpot over medium heat. Cook and stir onion and garlic in hot oil until the onion is tender, about 5 minutes. Stir carrots and celery into the onion mixture. Pour vegetable broth into the stockpot; add potato, bay leaves, basil, sea salt, pepper, and thyme. Bring the mixture to a boil, reduce heat to medium-low, and cook at a simmer until the vegetables are beginning to soften, about 20 minutes. Stir beans into the soup; continue simmering until the beans are hot and tender, about 20 minutes more. it was ok. wouldn't make it the same way. less ingredients. I think it waa overpowered by to many ingredients. I like beans and want more of the beans flavor. less is more for me I guess. 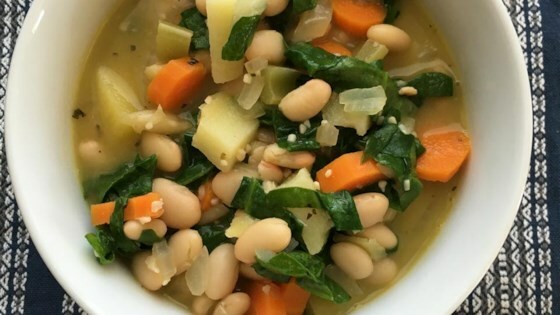 My husband says this is the BEST bean soup ever! We try to eat vegetarian through the week and enjoy meat only on the weekends. Great recipes like this make it all possible. Very simple to make.All I changed was, I added one can ,and one 32 oz vegetable broth, I didn't do the four cups. We all loved this soup. This soup is soooo good! No changes made & it was delicious!